Sri Lankan President Mahinda Rajapaksa is a former lawyer who has described himself on his website as "a rebel with a cause". The high points of his political career have been the defeat of Tamil Tiger rebels in May 2009 and his election win over Sarath Fonseka in January 2010. In both triumphs, his critics say he displayed a ruthless streak and a capacity to condone or overlook the use of violence if it served his political purposes. The president denies this. Now he is accused of presiding over a slide towards dictatorship, as parliament votes on constitutional amendments which would hugely increase the president's powers and abolish terms limits. During his first stint in the top office he was accused of condoning a crackdown on dissent. His supporters were alleged to have been involved in the murder of journalists who were critical of the government, claims rejected by the authorities. The most high profile example of this was the murder of newspaper editor Lasantha Wickrematunge in January 2009. His case was all the more remarkable because he wrote an editorial - published posthumously - which accused President Rajapaksa's government of being responsible for his death. "In the name of patriotism you have trampled on human rights, nurtured unbridled corruption and squandered public money like no other president before you," Mr Wickrematunge's editorial said in words addressed directly at the president. The president and his supporters strenuously deny any involvement in the murder. Despite the criticisms and concerns over his leadership style made by former President Kumaratunga, Mr Rajapaksa has maintained his support among Sri Lanka's Sinhalese majority. His supporters point to continued economic growth during his first term and say he ensured that food supplies remained constant after the devastating 2004 tsunami. When money from the West looked as if it may dry up because of concerns over human rights abuses towards the end of the civil war, the president tried to offset this by making overtures to China. His support in the south has remained constant largely because he has remained closely associated with the Sinhala nationalist cause and is seen as a man of the masses. "He comes across as the homegrown country boy [to the poor farmers and fishermen] whom they feel comfortable with," analyst Jehan Perera told the Associated Press. As labour minister, Mr Rajapaksa tried to push through legislation to guarantee the rights of workers - but failed after complaints from big businesses. While in charge of fisheries and ports, he became popular for his scheme to find new housing for slum-dwelling fishermen. Mr Rajapaksa, now 64, became the country's youngest ever parliamentarian in 1970 at the age of 24. He went on to become leader of the Sri Lanka Freedom Party, prime minister in 2004, and then president in 2005. He comes from a political family - his father, DA Rajapaksa, represented the same region of Hambantota from 1947 to 1965. When Mr Rajapaksa became prime minister, he was seen as someone who favoured a negotiated settlement with the Tamil Tiger rebels. But after signing a poll deal with two nationalist parties, his stance became increasingly hardline. He launched his campaign for the presidency by rejecting the rebels' demands for Tamil autonomy. 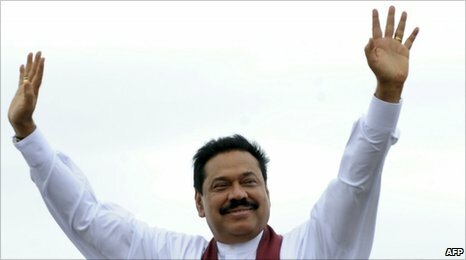 After four years of bitter fighting, President Rajapaksa hailed the defeat of the rebels as a vindication of his tough and uncompromising stance against them.